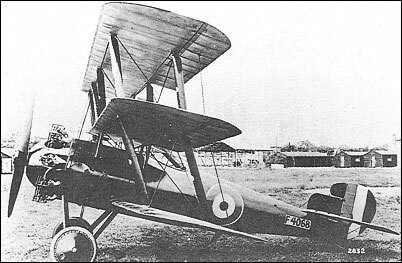 Despite the fact that, by 1918, the triplane configuration was widely considered as passe for the fighter, on 14 May of that year, Sopwith was awarded a contract for three prototypes of a new single-seat fighting triplane, conforming to the RAF Type I specification and named the Snark. Powered by a 320hp A.B.C. Dragonfly I ninecylinder radial and featuring a plywood monocoque fuselage, the Snark was an equi-span staggered triplane and its designed armament was somewhat radical in the weight of fire that it offered, consisting of two synchronised 7.7mm guns on the fuselage and four weapons of similar calibre mounted two per side under the bottom wing. The first Snark was passed for flight test in September 1918, but unavailability of a Dragonfly engine and the decision to make various minor modifications delayed manufacturer's trials until September of the following year, the aircraft arriving at Martlesham Heath for official trials on 12 November 1919. The second prototype reached Martlesham on 17 March 1920, and the third prototype, with a 360hp Dragonfly la engine, late in the year. Apart from engine problems, the Snark triplanes suffered fuselage deterioration and all three were written off in 1921. T agree wit Bob Shlafer. The Sopwith Snark was by no means a one-off "oddball" aeroplane. It was designed in accordance to a specified designation which did not exclude the Triplane configuration. Had the engine worked out, the Snark would have been a fast, agile and heavily-armed fighter, and well able to deal with the expected aerial conflicts of 1919. The fact that the Lewis guns could not be reloaded or unjammed in flight is hardly worth considering, The machine had six machine guns and an outstanding performance and looked the part. Sopwith mfg. some of the best A/C of WW1 and had the engine worked out, I'm sure both the Snark and faster Snapper would have been as, if not more satisfactory as the Pup, Camel, Dolphin and Snipe which preceeded. By "written off" do you mean"crashed" or do you mean"Struck Off Charge" to use the correct Service parlance? Also,and it is not clear from the history, was the Snark actually the last ever triplane fighter to be produced? I think it probably was and can find no other cotradictory reference anywhere. Woohoow, that's ans crazy aircraft!!! !